If your business have a POS system in place, you currently give your customers a physical Loyalty Card… Upon being ready to use your Loyalty Card at the register, the customer give you their card, and you scan the bar code of the Loyalty Card with your scanner. To keep the process simple, the function stores one card at a time. 1. The customer normally have a physical Loyalty Card from the store. 2. The business offers a new way to store the card inside the Store’s App, so the customer don’t have to worry about carrying the physical card. 3. If they don’t have it already, the customer downloads the app, and tap on the Virtual Loyalty Card button. 4. 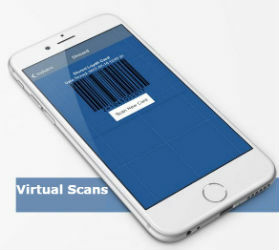 Using the app, the Bar Code of the physical card is scanned with the phone’s camera into the app. 5. The Bar Code of the physical card is now stored inside the app on the customer’s phone. 6. When at the store, the customer opens the app and shows the Store staff the bar code in their phone. There is no configuration necessary with this function. Everything is setup once we add the feature to your app.